I am truly lucky to be surrounded by family. Life gets busy, but every month, we have a family lunch for all of us to share a meal and spend some quality time together. There are many birthdays to be celebrated in November so of course, cake was in order. I tried out these chocolate coconut cupcakes from So, How’s it Taste? 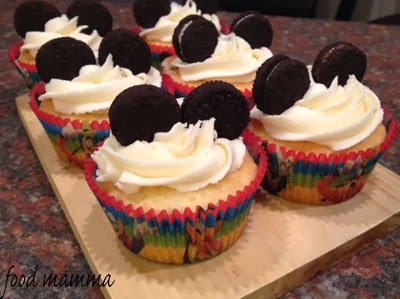 The cupcakes were really easy to make and were baked in less than 30 minutes. 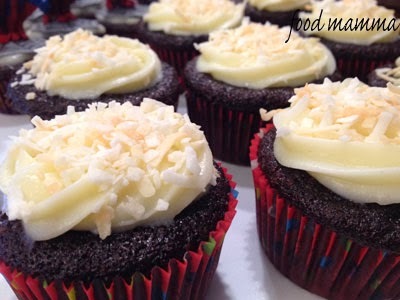 I decided to go with a classic cream cheese frosting, which paired really well with the coconut and the chocolate. 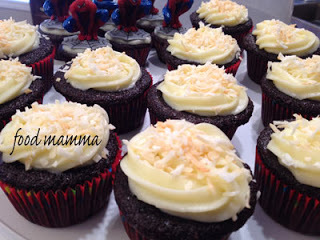 To top it all off, I toasted some coconut in the oven while the cupcakes were baking, which provided the perfect crunch with every bite. 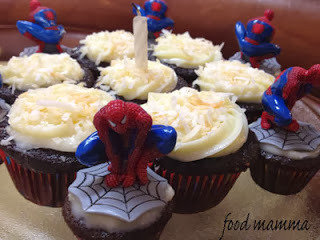 These were great and perfect to celebrate both the young and the young at heart. From, So, How’s it Taste? Stir together sugar, flour, cocoa, baking powder, baking soda, and salt in large bowl. Add eggs, milk, oil, vanilla, and coconut extract; beat on medium speed of mixer 2 minutes. Stir in boiling water (batter will be thin). Gently fold in shredded coconut. 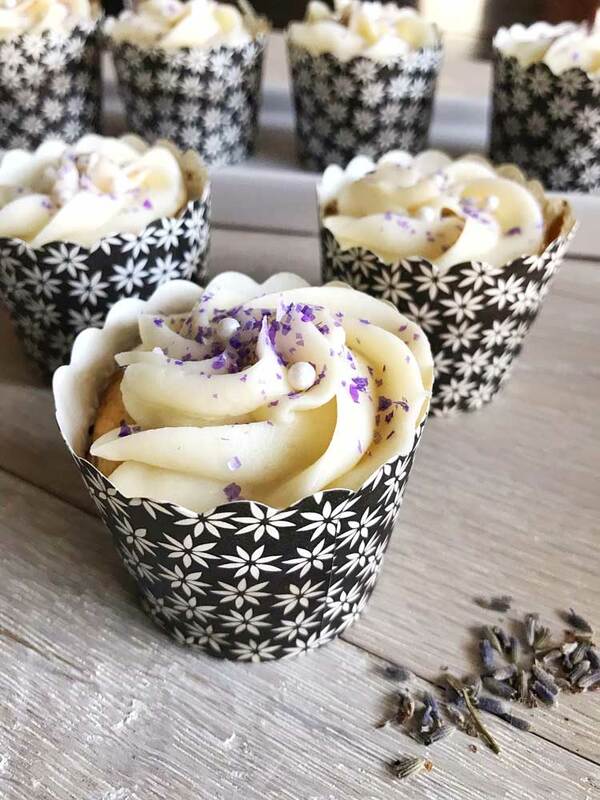 Line muffin cups (2-1/2 inches in diameter) with paper bake cups. Fill cups 3/4 full with batter. Bake 22 to 25 minutes. Yesterday was Q’s fifth birthday. I can’t believe he is five! He has brought so much joy to our lives and I am thankful for him everyday. Since our Disney cruise is coming up, we have Mickey on our minds. It made sense that the theme for his school celebration should be of our favourite mouse. 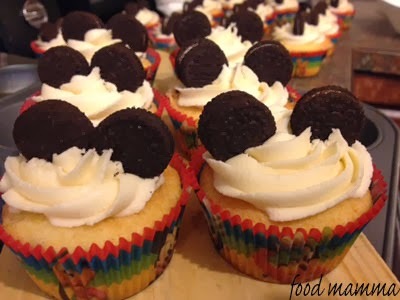 Chocolate chip cupcakes were topped with buttercream, finished with a couple of mini Oreos made to look like Mickey ears. 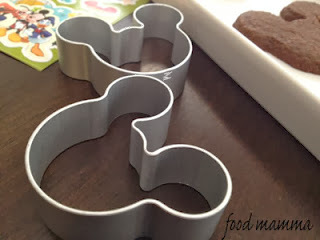 To continue with the theme, I was eager to use my new Mickey Mouse cookie cutters. I rolled out some chocolate shortbread and made the cutest little cookies. 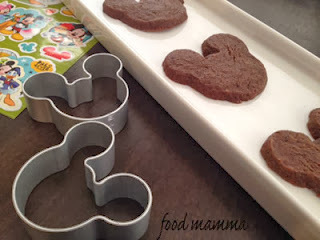 Want to win one of these Mickey cookie cutters for yourself? Just leave a comment, either here or on Facebook, telling me who your favourite Disney character is. Contest closes on Monday, November 11th at noon MST. Today is hubby’s birthday! Happy Birthday honey!! Since our week is usually filled with tons of activities for Q, we celebrated with family over the weekend. We had a tandoor party and made some delicious stuffed naans. I’ll have to fill you in on this soon. 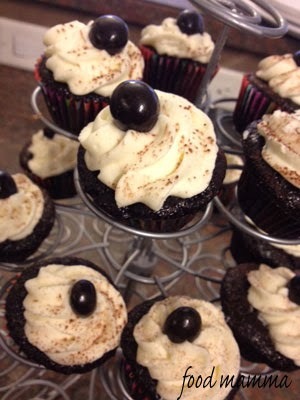 As for cake, his request this year was for white chocolate mocha cupcakes. After a few searches, I settled on a recipe from Ali from Gimme Some Oven. I’ve recently started following her and love all the food that she posts. Since it seemed like I was catching my son’s cold, I needed something quick and simple and this recipe seemed pretty easy. The whipped frosting was so nice and light, and very reminiscent of a mocha drink. 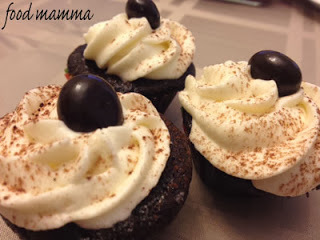 Dusted with cocoa powder and topped with a chocolate covered espresso bean, it was a birthday treat that hubby really enjoyed. Preheat the oven to 350 degrees F. Line 24 muffin tins with paper liners or spray with nonstick cooking spray. In a large bowl, whisk together the flour, sugar, cocoa, baking soda, baking powder, and salt until combined. In an electric mixer fitted with the paddle attachment, combine the buttermilk, oil, eggs, and vanilla. With the mixer on low speed, slowly add the dry ingredients to the wet until combined. Add the 1 ½ teaspoons of espresso granules to the cup of hot coffee and stir to combine. With mixer still on low, add in the coffee/espresso mixture and stir just to combine, scraping the bottom of the bowl with a rubber spatula. The batter will be really runny, but don’t worry! 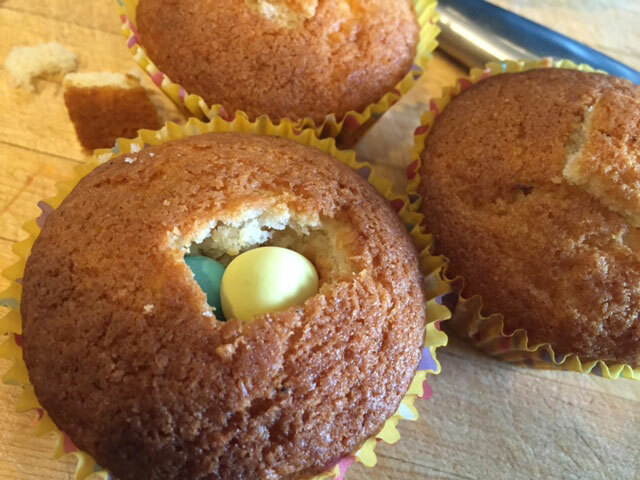 Using a large scoop (about 3 tablespoons), distribute the batter into the prepared muffin tins. Bake for 18-22 minutes, or until a toothpick comes out clean. Cool in the pans for 15 minutes, then remove them onto a cooling rack and cool completely. 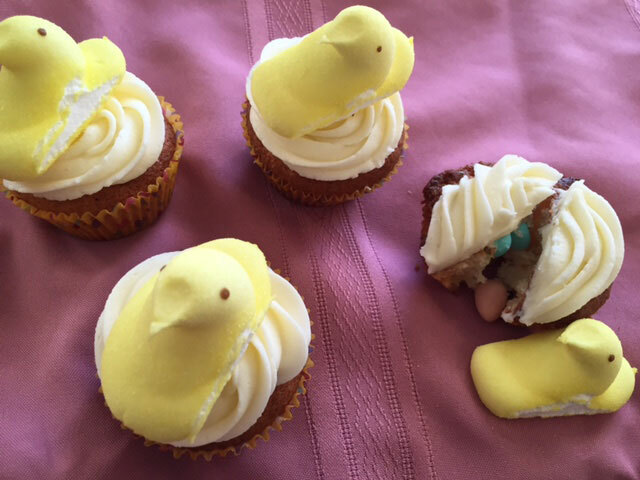 Top with the white chocolate whipped cream frosting, and either serve immediately or refrigerate for up to 48 hours. Place the chopped white chocolate in a heatproof bowl and set the bowl over a pan of simmering water. Melt, stirring occasionally. Meanwhile, bring 1/2 cup of the cream to a boil in a small saucepan. When the chocolate is fully melted, move the bowl to a work surface and pour in the hot cream. Let stand for 1 minute. Stir gently until the cream is incorporated and the mixture is smooth. Let the chocolate/cream mixture stand until it is completely cool. The mixture must be at room temperature before it is added to the whipped cream. In the bowl of a stand mixer fitted with the whisk attachment, beat the remaining 1 cup of heavy cream only until it holds the softest peaks. With the mixer on high speed, add the white chocolate all at once and continue to beat just until the mixture holds firm peaks. Transfer the cream to a bowl, press a piece of plastic wrap gently against the surface and refrigerate for at least 2 hours. Once cooled, frost cupcakes as desired. Today’s my sister-in-law’s birthday – Happy Birthday R!! As much as she didn’t want to celebrate, we did convince her that cake was in order. Her cake of choice was one of my faves, red velvet. 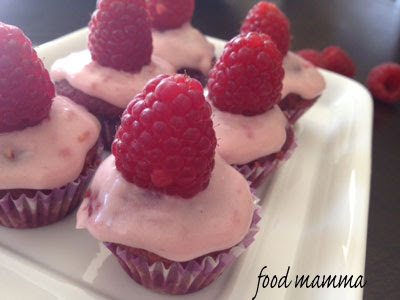 I decided to change up the frosting a little and use some of the great raspberries that we have been enjoying. 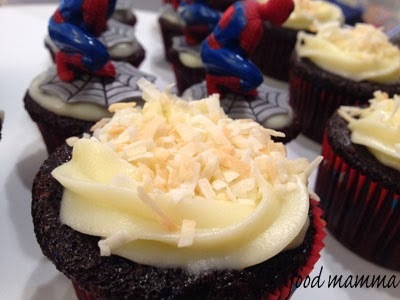 With the weather being nice and hot, and not really conducive to frosting, I kept the consistency perfect for spreading. For a stiffer icing that you can pipe, just add a little more icing sugar. 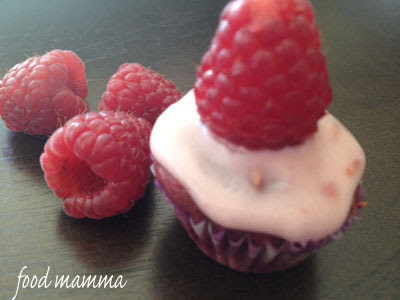 The icing was yummy and complemented the red velvet cupcakes perfectly. With lots leftover, it will be hard to not go dunking everything in it! Cream the cream cheese and butter together until nice and smooth. 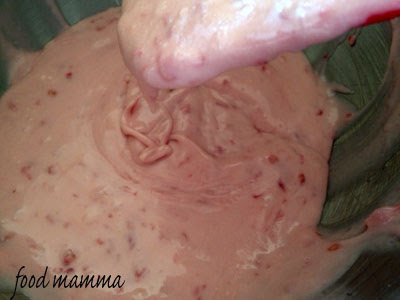 Add the raspberries and mix again. With your mixer on, slowly incorporate the icing sugar until you reach the desired consistency. about not spending the holidays at home. box but here is what I decided on. 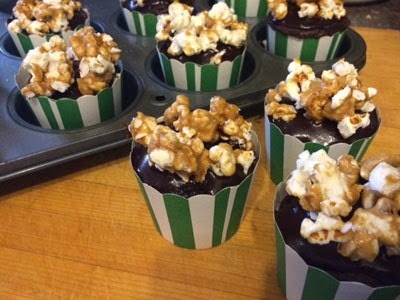 Click to find out recipes for these tasty treat! 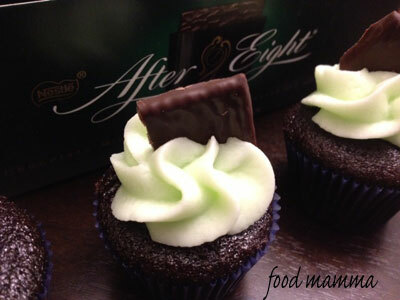 Mint and chocolate. What a perfect combination. 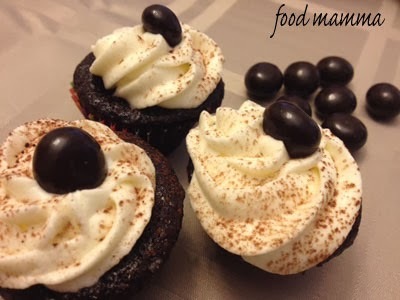 It works well with coffee (peppermint mochas, yum! ), cookies and definitely dessert. It was the inspiration for some cupcakes I made a couple months ago for hubby’s birthday. 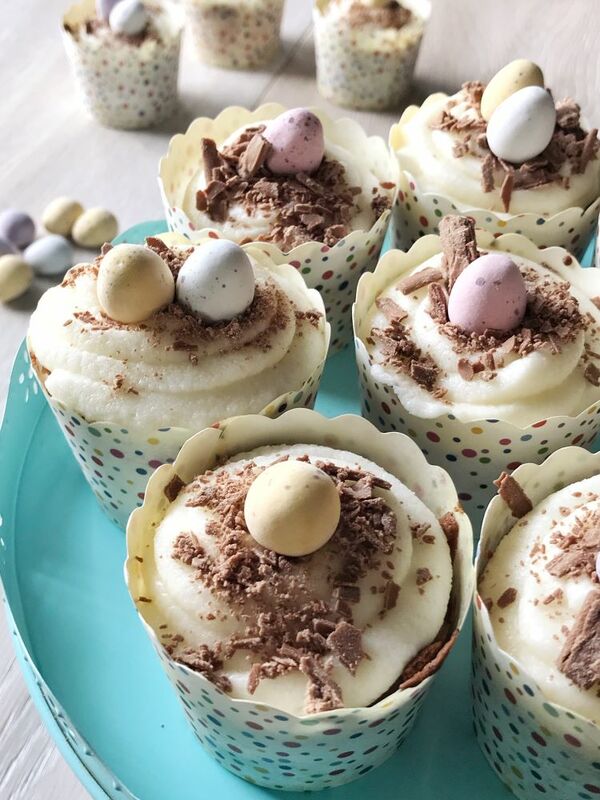 Although I had made some ice cream cake to celebrate at home, I thought it would be fun to send some cupcakes for him to celebrate at work. 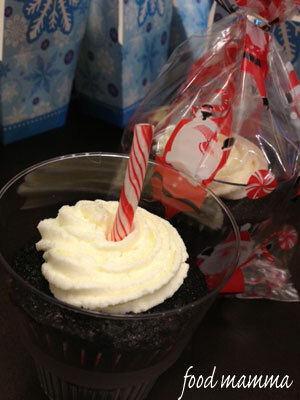 Hubby’s co-workers were treated to After Eight Cupcakes – chocolate cake topped with peppermint buttercream. The combination worked well and so I made them again this weekend. Instead of using the chocolate as a garnish, I used candy canes. The Candy Cane Cupcakes were made for the Food Blogger Bake Sale. 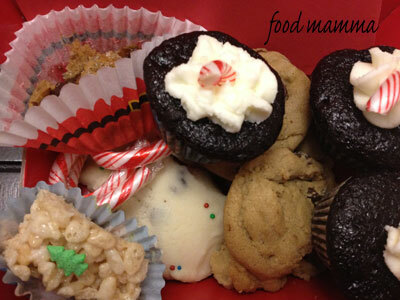 A Holiday Edition of the bake sale was created to raise funds for Meals on Wheels. Fellow food bloggers Vincci and Dan have worked hard in planning and promoting this event – you guys are awesome! 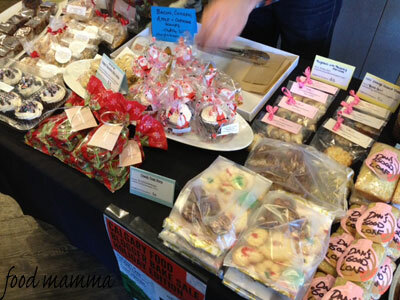 When I went down this morning, the tables were full of yummy goodies and creative packaging. The event has been extended to tomorrow so be sure to go down to Casel Marche, try some wonderful baking while benefiting a great cause.